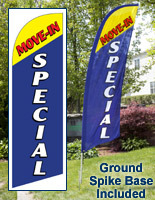 The FOR LEASE Swooper Flag Sells At Every Day Low Price Points Here! 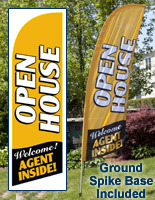 Rent, Sale and Open House Banners are Offered as Well! 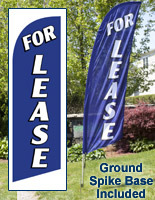 The FOR LEASE Swooper Flag is Offered in Many Different Colors! FOR LEASE Swooper flag comes with a black bag to facilitate transport. Pole consists of (2) aluminum and (2) fiberglass segments for a low price. Ground spike base for posting the flag on the front yard of properties. White on red color pattern and 8' height makes the message easy to read. This 8' FOR LEASE swooper flag is meticulously engineered to balance an eye-catching design with product features that add a significant amount of value for the users. What attributes make this feather banner so effective at attracting attention? 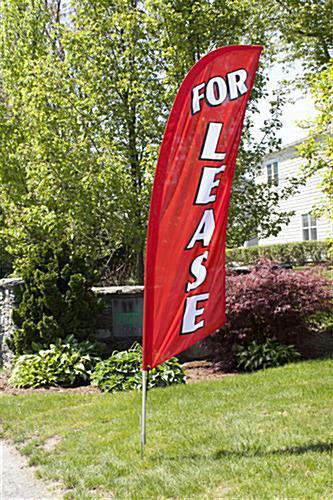 The 8' FOR LEASE swooper flag is dyed bright red to ensure it stands out in any environment. Text is printed in bold white lettering to contrast with the red background. 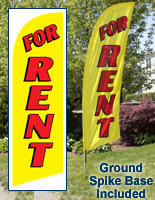 This FOR LEASE swooper flag, also known as a blade banner, is easy to read from a distance or a moving vehicle due to the high contrast color scheme. Once placed on the ground spike base, the display stands just over 8 feet high. 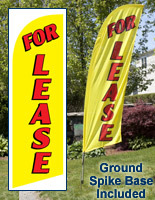 Real estate agents or property managers can place the FOR LEASE swooper flag that mounts on a ground spike practically anywhere, such as in the front yard, along a driveway, by a mailbox or at the entrance to an apartment complex. The ground spike is fabricated from steel for repeated use. The pennant features a knitted polyester construction that is lightweight, making this outdoor display a FOR LEASE swooper flag that flutters in the wind. A cord attaches the feather banner to the pole so the fabric is pulled taut and the message is easy to read. 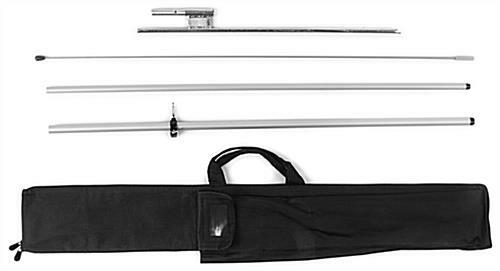 The FOR LEASE swooper flag that is portable weighs only 4 lbs with all the components loaded into the carrying bag. The pole is comprised of four segments that detach from each other for transport. The bottom segments are manufactured from aluminum, while the top two segments have a fiberglass construction so the FOR LEASE swooper flag maintains the classic promo banner shape. During the design phase of this product's development, portability was determined to be of utmost importance because of realtors' needs. 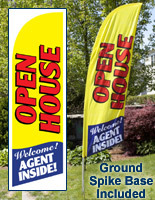 This FOR LEASE swooper flag has all the features needed and wanted by real estate agents in a portable banner. The fact all components fit compactly into the carrying bag allows the unit to fit easily into the trunk of any car. Additionally, only one person is required for assembly.